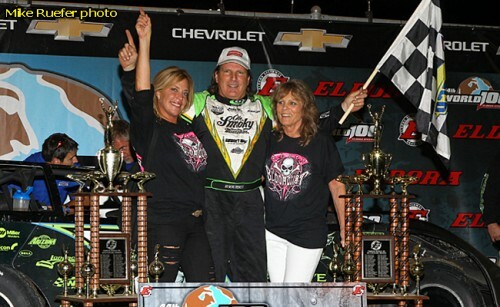 ROSSBURG, OH – Sept. 6, 2014 – Nothing could stop Scott Bloomquist from claiming his fourth World 100 trophy Saturday night at Eldora Speedway. Not a lap-19 penalty that dropped him from the lead to the tail of the field. Not a steady Dale McDowell looking for an Eldora crown jewel sweep. And not slower traffic during the race’s closing laps. Bloomquist’s No. 0 Sweet-Bloomquist machine was unstoppable at the historic half-mile oval as it carried the National Dirt Late Model Hall of Famer through the field for a $47,000 victory in the 44th running of the DIRTcar UMP-sanctioned event. Advancing from his fifth starting spot, Bloomquist first took the lead from McDowell on lap 19 only to be penalized for an unapproved window net and sent to the tail of the field when the caution waved on the following lap. That only made things more interesting. Bloomquist stormed back to the front and retook the lead from McDowell on lap 72 of the 100-lap race. He continued his torrid pace through the remaining distance, again knifing through traffic until he crossed the finish line with a half-track advantage. McDowell of Chickamauga, Ga., settled for the runner-up finish while 22nd-starting Jimmy Owens of Newport, Tenn., made a late charge to finish third. Jason Feger of Bloomington, Ill., and Matt Miller of Whitehouse, Ohio, rounded out the race’s top five finishers. Bloomquist was penalized for using a Lexan-supported window net. After opposing crew members protested that the piece could assist aerodynamics, officials ruled the window net was an unapproved device. It was removed from Bloomquist’s car and he was sent to the tail of the field for the restart. That didn’t faze Bloomquist. Restarting in the 29th position, he quickly began his march back to the front. He worked his way into the top 15 by lap 35 and was up to eighth by halfway. He cracked the top five on lap 55 and after grabbing fourth a few laps later, was elevated to second when 21st-starting Mason Zeigler of Chalk Hill, Pa., spun while attempting to take the lead from McDowell on lap 61 and collected third-running Jimmy Mars of Menomonie, Wis.
Bloomquist made sure the Eldora crowd new his plan under the ensuing caution by pumping his fist and making the cowabunga hand signal out of the driver’s window of his race car as he drove down the front straightaway. If not for Bloomquist, McDowell, 48, would have been the star of the show. Starting from the outside pole, he pulled his Team Dillon Racing Warrior ahead of polesitter Mike Marlar of Winfield, Tenn., on the start of the race and controlled the early laps. He gave up the lead after a lengthy side-by-side battle with Bloomquist, but was quickly reestablished to the point after Bloomquist’s penalty. McDowell again pulled away through the race’s middle portions until Zeigler began making his bid for the top spot. McDowell was given a brief relive when Zeigler got into turn three too hard on lap 61 and spun his machine to avoid making contact with the leader. But that only cleared the way for Bloomquist to move to second for the restart and to eventually take the lead 11 laps later. In falling one position short of his second World 100 victory, McDowell, who claimed a $100,000 payday in Eldora’s Dirt Late Model Dream in June, missed out on becoming just the third driver to win both of Eldora’s crown jewel events in the same season. Bloomquist’s charge through the field was the main highlight on a night that featured plenty of passing around Eldora’s high banks. Besides the charges by Bloomquist, Zeigler and Owens, Terry Phillips of Springfield, Mo., charged from 17th to ninth, Shannon Babb of Moweaqua, Ill., advanced from 29th to 10th and John Blankenship of Williamson, W.Va., moved from 32nd to 12th. The racy track surface didn’t go unnoticed by drivers, including the victor. 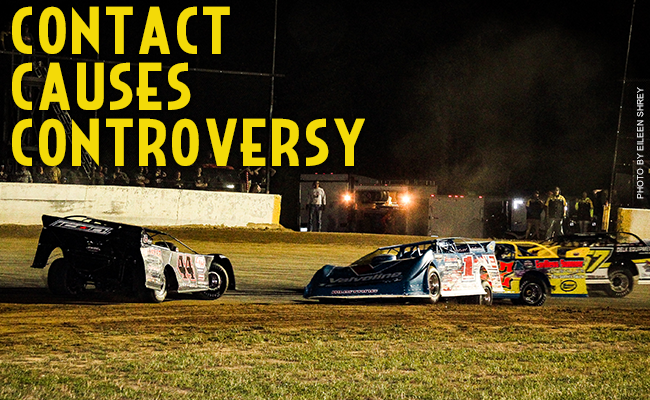 The main event was slowed by four cautions. The first was the lap-19 yellow that waved when Jared Landers of Batesville, Ark., slowed. Heat race winner Jackie Boggs of Grayson, Ky., slowed to bring out a lap-30 caution and Bobby Pierce of Oakwood, Ill., dropped from the fifth spot to cause a lap-53 yellow. The final caution was for Zeigler’s lap-61 spin that collected Mars. Heat No. 1 (15 laps – Top 3 Transfer): 1. Jackie Boggs, 2. Jason Feger, 3. Jason Hughes, 4. 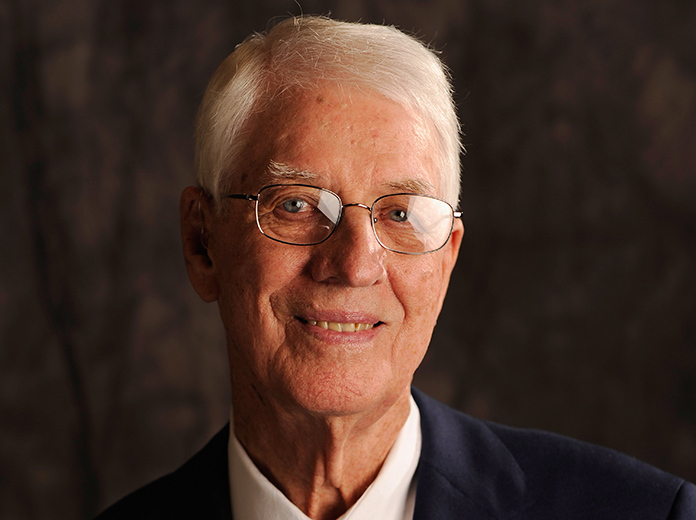 Dennis Erb Jr., 5. John Blankenship, 6. Don O’Neal, 7. Josh Adkins, 8. Brandon Sheppard, 9. Rusty Schlenk, 10. Tanner English, 11. Doug Drown, 12. McKay Wenger, 13. Jerry Bowersock, 14. Tommy Bailey. 15. Bryant Dickinson, 16. Morgan Bagley, 17. Greg Johnson, 18. Vic Hill, 19. Jeff Babcock. Did not start: Andrew Gordon. Heat No. 2 (15 laps – Top 3 Transfer): 1. Scott Bloomquist, 2. Rick Eckert, 3. Jared Landers, 4. Bub McCool, 5. Jonathan Davenport, 6. Mason Zeigler, 7. Nick Latham, 8. Brian Ruhlman, 9. Curtis Deisenroth, 10. Tim McCreadie, 11. Jay Johnson, 12. Austin Hubbard, 13. Brandon Overton, 14. Don Hammer, 15. Rodney Hamblin, 16. Jon Henry, 17. Brian Birkhofer, 18. Brian Gray. Did not start: Billy Ogle Jr., Walker Arthur. Heat No. 3 (15 laps – Top 3 Transfer): 1. Kent Robinson, 2. Matt Miller, 3. Gregg Satterlee, 4. Tyler Reddick, 5. Earl Pearson Jr., 6. Dustin Linville, 7. Chris Brown, 8. Shannon Babb, 9. Randy Weaver, 10. Steve Casebolt, 11. Jason Riggs, 12. Mike Spatola, 13. David Breazeale, 14. Tim Lance, 15. Jason Welshan, 16. Curtis Roberts, 17. J.T. Conley, 18. Scott Knepley, 19. Don Gordon, 20. Mack McCarter. Heat No. 4 (15 laps – Top 3 Transfer): 1. Chris Madden, 2. Bobby Pierce, 3. Darrell Lanigan, 4. Jimmy Owens, 5. R.J. Conley, 6. Billy Moyer, 7. Cody Mahoney, 8. Frank Heckenast Jr., 9. Billy Moyer Jr., 10. Devin Moran, 11. Timothy Culp, 12. Steve Lance Jr., 13. Ross Nicastri, 14. Dan Schlieper, 15. Casey Noonan, 16. Charles LaPlant, 17. George Lee, 18. Tim Sabo. 19. Ryan Gustin. Did not start: Ernie Cordier. Heat No. 5 (15 laps – Top 3 Transfer): 1. Dale McDowell, 2. Jimmy Mars, 3. Terry Phillips, 4. Shane Clanton, 5. Eric Wells, 6. Brandon Kinzer, 7. Chad Ruhlman, 8. Donald McIntosh, 9. Chase Junghans, 10. Shannon Thornsberry, 11. Jon Hodgkiss, 12. Mark Dotson, 13. Cecil Eunice. 14. Terry Wolfenbarger, 15. Randy Korte, 16. Steve Francis, 17. Delmas Conley, 18. James Rice, 19. Bill Lewis. Did not start: Chris Nash. Heat No. 6 (15 laps – Top 3 Transfer): 1. Mike Marlar, 2. Eddie Carrier Jr., 3. Wendell Wallace, 4. Brian Shirley, 5. Duane Chamberlain, 6. Brad Neat, 7. Rod Conley, 8. Rodney Melvin, 9. Jacob Hawkins, 10. Chris Simpson, 11. Wayne Chinn, 12. Aaron Scott, 13. Jim Shereck, 14. Jeep Van Wormer, 15. Brian Diveley, 16. Austin Smith. Did not start: Scott James, Ron McQuerry, Butch Kruckeberg. B-Main 1 Finish (20 laps – Top 5 Transfer to A-Main): 1. Mason Zeigler, 2. Dustin Linville, 3. Jonathan Davenport, 4. Dennis Erb Jr., 5. Shannon Babb, 6. Bub McCool, 7. Don O’Neal, 8. John Blankenship, 9. Tyler Reddick, 10. Brandon Sheppard, 11. Brian Ruhlman, 12. Austin Hubbard, 13. Jason Riggs, 14. Rusty Schlenk, 15. Randy Weaver, 16. Jon Henry, 17. Jay Johnson, 18. Tanner English, 19. Doug Drown, 20. Chris Brown, 21. Nick Latham, 22. Josh Adkins, 23. Curtis Deisenroth. 24. Steve Casebolt, 25. Tim McCreadie. Did not start: Earl Pearson Jr. B-Main 1 ‘Scramble’ winner: Don O’Neal. B-Main 2 Finish (20 laps – Top 5 Transfer to A-Main): 1. Jimmy Owens, 2. R.J. Conley, 3. Billy Moyer, 4. 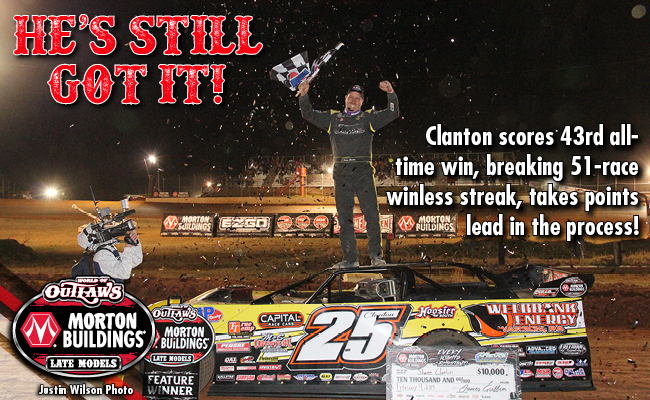 Shane Clanton, 5. Brandon Kinzer, 6. Brian Shirley, 7. Chad Ruhlman, 8. Brad Neat, 9. Frank Heckenast Jr., 10. Rod Conley, 11. Donald McIntosh, 12. Billy Moyer Jr., 13. Devin Moran, 14. Cody Mahoney, 15. Jacob Hawkins, 16. Timothy Culp, 17. Chase Junghans, 18. Duane Chamb. 19. Rodney Melvin, 20. Chris Simpson, 21. Wayne Chinn, 22. Shannon Thornsberry, 23. Jon Hodgkiss. B-Main 2 ‘Scramble’ winner: Brian Shirley. DIRTcar UMP racing action is brought to fans across the country by many important sponsors and partners, including: American Racing Custom Wheels (Official Custom Wheel), Arizona Sport Shirts (Official Apparel Company), Armor All (Official Car Care Products), Hoosier Racing Tires (Official Racing Tires), Lincoln Welder (Official Welder), STP (Official Fuel Treatment), VP Racing Fuel (Official Racing Fuel), DirtonDirt.com (Hard Charger Award) and McCarthy’s One Hour Heating & Air Conditioning (Raye Vest Memorial Pill Draw Award); in addition to contingency sponsors: Butlerbuilt, Cometic Gasket, Comp Cams, Edelbrock, JE Pistons, JRI Shocks, Mobil 1, MSD, Ohlins Shocks, QuarterMaster, Penske Shocks, Roush Yates Performance Parts, Superflow Dynos and Wrisco Aluminum; along with manufacturer sponsors Capital Race Cars, Integra Shocks, Intercomp, Jake’s Carts, Racing Electronics, Rocket Chassis, and TNT Rescue.